Just because you don’t eat veal yourself doesn’t mean you can’t do your part to keep the industry going strong. Here’s how to pitch in! Dairy farms need to keep their cows calving in order to ensure that they continually produce milk. 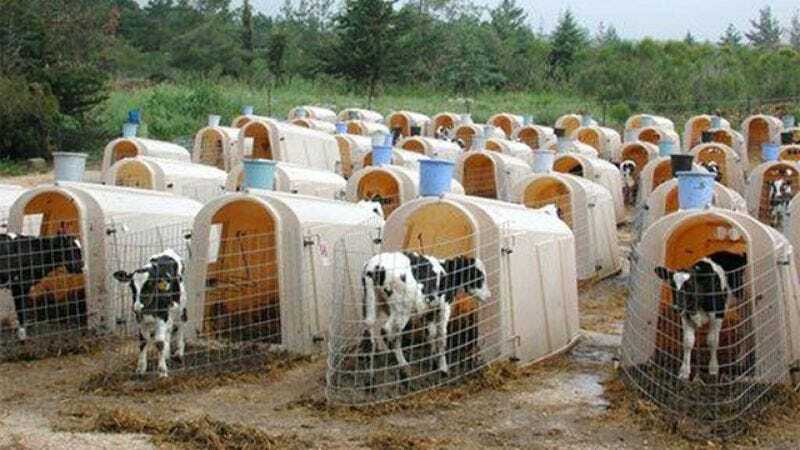 While female calves can be raised for dairy, most farms have no use for their steers, and they slaughter them for veal. Simply by keeping plenty of dairy in your diet and on your shopping list, you can support veal production with your dollars without ever eating a single morsel. It’s just that easy! Obviously, buying veal is the most efficient and direct way to support the industry, but if you don’t eat veal, it’s just wasteful. But by making veal cutlets your go-to gift for family and friends, you not only have an outlet for your purchases, but you may create some converts in the process! And consider going the extra mile by demonstrating proper preparation techniques for the delicate meat, ensuring that your loved ones know the full gustatory delights that veal has to offer even if you don’t and never will. These days, finding veal of any quality anywhere but a specialty butcher is one heck of an undertaking, but all businesses are slaves to supply and demand. Demonstrate demand and the supply will flow! Gather friends, neighbors, and coworkers at supermarkets in your area to raise protest signs and collect signatures. It shouldn’t take much to pressure superstores into stocking veal, but you need visibility. Once it’s on the shelves, shoppers will take it from there. With animal cruelty regulations tightening and the public warming to meatless lifestyles, it’s no doubt a tough time for cattle farmers. For those farmers to hear an outside voice thank them for their thankless labor and laud their service to society might not have an economic benefit to the veal industry per se, but on a personal level, it could be huge. So, why not bone up on your rhetoric and lift some spirits? Think one person can only do so much? Think again. Just by publishing an extensive multiyear study that purports to show significant long-term health benefits from veal consumption, you could single-handedly shift conventional wisdom on veal for the foreseeable future. Even with a dodgy methodology, fudged results, and strained conclusions, a study that produces digestible, eye-catching headlines like “Study Finds Veal Healthier Than Chicken” will quickly lodge itself in the public mind, especially if it’s conducted through an impressive-sounding institution. And once appealing information’s in there, good luck getting it out! A blow against wagyu is a victory for veal. Will you heed the call?